Wow, 1973. I always forget how old this record (and the beginning of Billy Joel's streak of hit songs) is. It seems more '78 to me for some reason. Anyway, this isn't one of my favorite Billy Joel albums for a few reasons. (First, let me state that a mediocre 70's-era Billy Joel record is still way better than most things, so it's all relative.) Aside from the plucky opener "Travelin' Prayer," the overall sound is very static from song to song, with the piano never really changing in vibe or sound. It's not a bad thing, it just gives the impression of a live show, which may have been the point. I know that Joel wasn't anybody at this point, so it's not like they were laying out huge production budgets for him. Regardless of the production, songs like "Captain Jack" and the title track just feel too anthemic and hammy for me. Conversely, "Ain't No Crime" seems like the precursor to later gems like "Big Shot," and "You're My Home" is like a peppier "Just the Way You Are." Both cool songs. 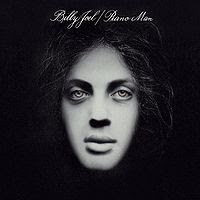 Maybe I just hate the song "Piano Man" so much that I am blind to the deeper cuts on this record and don't give them a listen often enough. Could be.